Larry Kim is the founder of WordStream and current CEO of Mobile Monkey. Larry Kim has been a pillar of the content marketing, social media, blogging and SEO community for the last couple of decades. Larry Kim an inspirational entrepreneur with plenty of quality quotations. 1) "Be funny, ironic, or outrageous–just don’t be BORING." 2) "Running a venture-backed business is kind of challenging... it's like you jumped off a cliff and have to build the parachute as you're falling." 3) "Why would you create something if not to promote it." 4) "It doesn't matter how much effort you put in, it's more about consistency." 5) "By definition, only 1% of your stuff is going to be the top 1% of your stuff." 6) "The same emotions that make people want to click on content are the same emotions that make people want to share things on social media." 7) "In SEO everyone has their own opinions but at the end of the day data wins the argument." 8) "SEO is many things, but predictable and everlasting it is not." 9) "Content marketing is just as important as it ever was but it is getting harder as more and more companies jump on the bandwagon. That means more competition for people's attention." 10) "The worst thing you could ever do is to abandon your blog." 11) "Be funny, ironic, or outrageous, just don't be boring." 12) "Strive to be a unicorn in a sea of donkeys." Thanks Larry Kim, founder of WordStream and Mobile Monkey, for all of the inspiring quotes and marketing motivation! 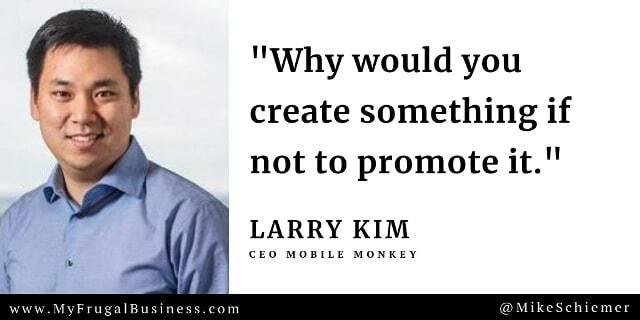 I hope you enjoyed this article about motivational business quotes from entrepreneur and marketing enthusiast Larry Kim. Interested in more articles about motivational business quotes?